Kalsamrit Muay Thai is a fully functional training facility which welcomes all new participants. Kalsamrit is excited to begin meeting all of your fitness needs with Muay Thai, Jiu Jitsu, Mixed Martial Arts, Boxing, Wrestling, Ladies Kickboxing, Kids Martial Arts and more. Our team of Instructors was strategically created, in order to supply you with the training you want, in the systems that interest you, from a single location and at convenient times of the day!! A single membership allows you to study multiple systems with encouragement and motivation you need. Whether you aim to increase your fitness level, learn new skills and techniques, burn off stress, socialize or engage your children with our Kids Programs, then Kalsamrit Gym is here to support you. With 4000 square feet and an incredible curriculum, there is much to see and much more to do. Sample a free week of classes or tour our studio, you are always welcome. Our space is comprised of two conjoined studios featuring our fitness studio, a full-size boxing ring, change-rooms for your convenience and an open and inviting atmosphere. You will find waiting for you all the equipment you need in order to have a great time in our classes. Just add yourself to the equation and success is the only option. 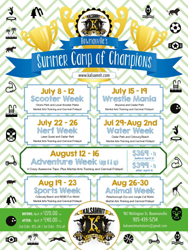 Camp of Champions presents the 2019 Summer Camp! These kid's summer camp programs fill up quick so register your child or children. Spaces Limited! Get in on Coach Dylan's Strength & Conditioning Bootcamp! 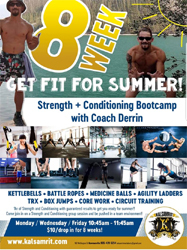 Get fit for this summer in this 8 Week program. * Train with Kettlebells, Battle Ropes, Medicine Balls, Agility Ladders, TRX, Box Jumps, Core Work, Circuit Training and more. Kalsamrit Martial Arts will be providing it's martial arts after school program again this year! After great success from the children in our last years program, we will be continuing this to help parents and students this year. Kalsamrit Martial Arts is providing women with great Ladies Kickboxing program in Bowmanville and Port Perry! 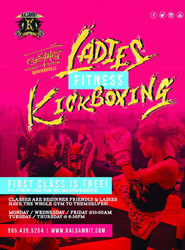 Ladies only kickboxing is a great way to to learn self defense, stay fit and lose weight, all well having fun. Classes are beginner friendly & ladies have the gym to themselves! The owners of Kalsamrit consider every member a part of the family and provide a safe, welcoming and fun environment. My husband and I has a great time this morning! We really liked Barry. He was super cool, approachable, knowledgeable,…. 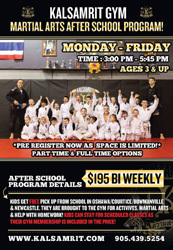 So many amazing programs at this gym for kids. Not only do they offer an impressive schedule of martial arts training…. Kalsamrit has brought my fighting skills to a whole new level. Plus my son has gained confidence and is in great shape. Muay Thai changed my life. I use to get picked on, but now I have 4 championship titles and stop people from bullying others.